A few weeks ago I was in the kitchen of a busy Rockville, MD home. Prior to starting the procurement meeting, the six Moms and I chatted about all sorts of matters, including being over the age of 40. If you’re organizing a school auction, it’s likely that your auction guests are nearing or hovering around that age. 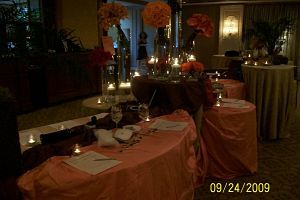 If you’re a nonprofit silent auction, some of your guests may only vaguely remember their 40th birthday party. So if you want us to bid … be kind. Here are three silent auction ideas to pamper the “forty-wonderful”and older crowd. Inexpensive, fun reading glasses seem to be sold everywhere these days. 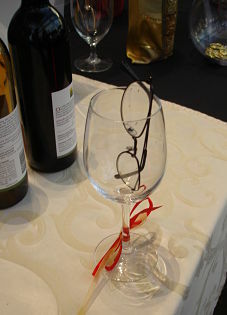 Pop a few into some wine glasses and place them around the silent auction area, as they did at this wine event I worked. Hotel lighting is often a few degrees too dim. Sometimes it’s because the hotel has inappropriate lights for a silent auction. Other times it’s because the organization (wrongly) thinks softer lighting is appropriate for the reception. I could spend a long time talking about this point and giving examples. I’ll refrain and simply encourage you to brighten the room. Such simple idea, yet rarely followed. Increase the font on your silent auction descriptions. Make it easy to read the display from a distance of a few feet. This is 12-point font and difficult to read in dim lighting, especially after drinking a cocktail. This is 24-point font and easier to read, even after drinking two cocktails. Don’t you agree? Which font size would you prefer as you walked by the tables? Make friends with the over-40 crowd. They are entering their prime earning years and have more cash to offer than some other segments of the population. Is this Barbara in Boston? If so, honey, what kind of teleclass? Something like: “How to get your laugh back after chairing a benefit auction when you’re over 40” ?!? That WOULD be a niche market! I’m curious as to what you’re thinking. Just attended a +30 high school reunion. Name badge font was so small, unless I was leaning into the person’s chest, I couldn’t read their name. Agree. INCREASE THE FONT SIZE for us over 40 folk. Ah Mary, good point. Especially useful at a reunion where it might be uncomfortable to not recognize/remember someone. It would be convenient to glance quickly at their namebadge in order to jog our memory, but the font size needs to support that.